Formula 1 boss Bernie Ecclestone has handed financially-troubled team Caterham a boost as they return to the grid at the Abu Dhabi Grand Prix. Ecclestone has waived freight costs and chartered a plane for staff attending the season-ending race. The team, who went into administration in October, are back racing after raising £1.8m from crowd-funding. "They wanted to go, so we've transported them at no cost to them," said Ecclestone. More than 200 staff at Caterham's Leafield factory in Oxfordshire have been made redundant. The team were last on the grid at the Russian Grand Prix in Sochi in October, missing the following two races in the United States and Brazil. "We've at least helped them to some degree, something we need not have done," Ecclestone added. "We've even chartered another plane to take them. "We've gone a little bit over the top, but anyway, we've done it." 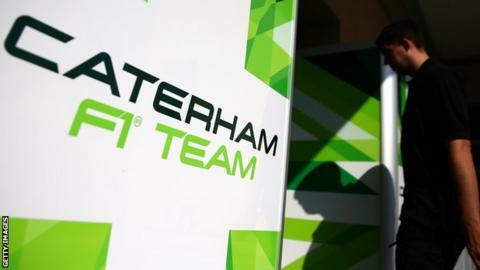 Administrator Smith & Williamson had set Caterham a target of raising £2.35m through a public crowd-funding project to allow them to race again. But on 14 November, it confirmed sponsors would meet the shortfall and 40 team personnel would be able to prepare the cars to race at the Yas Marina circuit in Abu Dhabi this weekend. Caterham's fund has now raised more than £1.9m from more than 6,000 backers. Smith & Williamson reset its original deadline on the project to 23 November in the hope of finding a buyer to take the team into next season and beyond. Finbarr O'Connell, representative for the administrators, is set to meet meet a potential purchaser at the Abu Dhabi race.